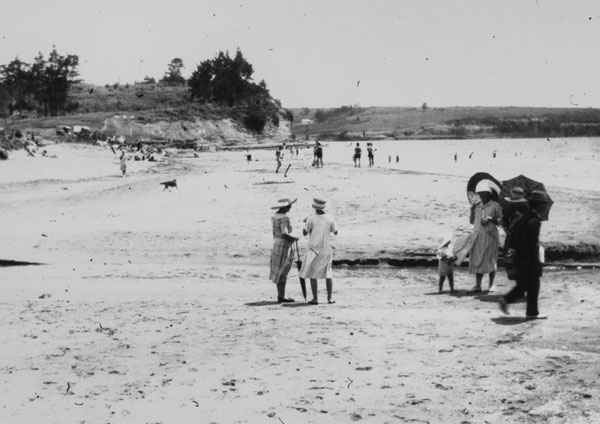 On now in the Angela Morton room at Takapuna Library is Beaches: Devonport to Waiwera. Showing camping and cars and everything in-between, the focus is on how we’ve enjoyed our beaches and the part they’ve had to play in Kiwis’ lives. 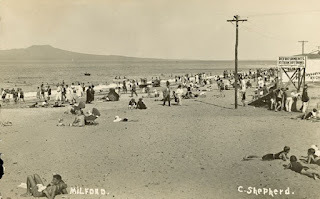 Ref: Crowds on Milford Beach, 1922, North Auckland Research Centre, Auckland Libraries, T0505. The exhibition features images from the North Auckland Research Centre collections, alongside images from Sir George Grey Special Collections. Beaches have always been a big part of New Zealander’s lives. These photographs capture the wide variety of activities that take place on the sand and water of our coastline. Ref: Little Murrays Bay (Mairangi Bay), c1920, North Auckland Research Centre, Auckland Libraries, EF0020. Ref: Milford Surf Club members, 1925?, North Auckland Research Centre, Auckland Libraries, T2653. 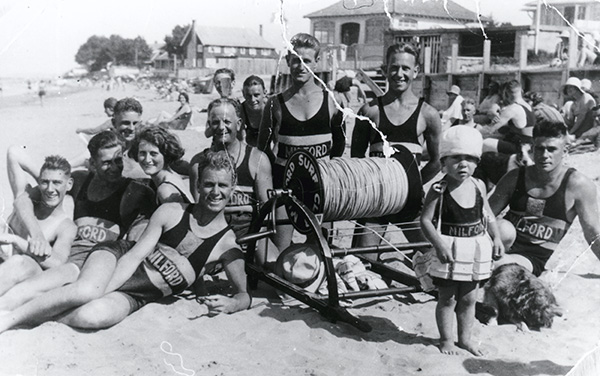 Surf lifesaving clubs have been an important part of New Zealanders' beach-going experience. 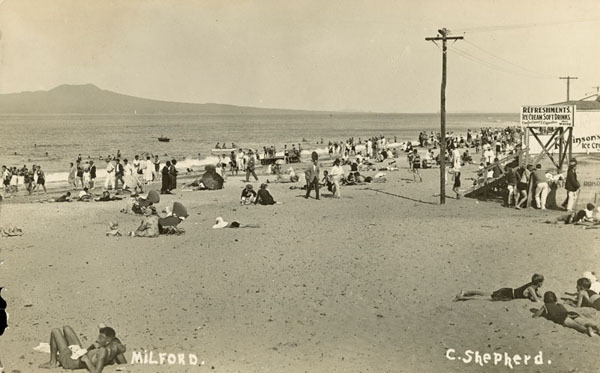 Milford Surf Club, formed in 1926, was one of Auckland’s earliest and it followed similar models in Australia and Lyall Bay in Wellington. 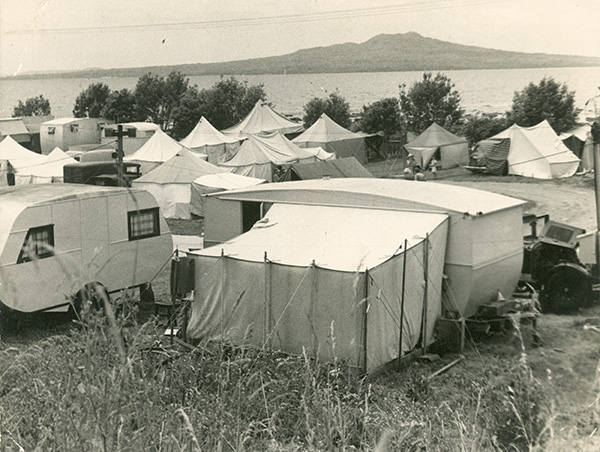 Clubs were also established at Red Beach, Orewa, Mairangi Bay and Brown’s Bay. The Milford Club uniform was dark red with a white band. The Club regularly won lifesaving competitions during its heyday in 1930s. Women were not able to join as full members of surf clubs in New Zealand until 1980, but were able to join clubs as non-active members, or could join women’s only clubs. The Milford Girls Surf Club was established in 1932. 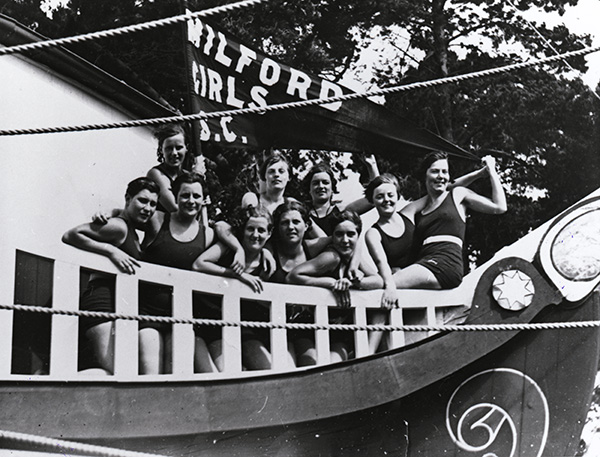 Ref: Members of the Milford Girls Surf Club in the bow of the Milford Pirate Shippe, 1930s, North Auckland Research Centre, Auckland Libraries, T1452. Ref: James Lyon, Takapuna Beach Motor Camp, 1930s, North Auckland Research Centre, Auckland Libraries, T7037. 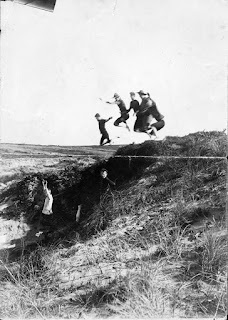 Ref: Northcote Boy Scout camp at Campbells Bay, 1912, North Auckland Research Centre, Auckland Libraries, N0109009. 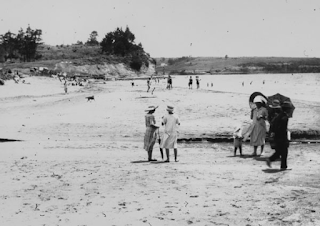 The exhibition features a huge variety of images and really captures the New Zealand beach experience as seen from Devonport to Waiwera over the past 100 years. The exhibition is on until January 10th in the Angela Morton Room on level 1 of Takapuna Library. While you visit Takapuna Beach this summer, be sure to pop by the library to see it!